From left, Bruce Haase; FON Founder & Treasurer Rudy Haase; and FON President Syd Dumaresq. The rain held off and there was a good crowd attending the dedication in honour of Mickie and Rudy Haase. A couple of years ago, the Cove Garden, which is owned by the Chester Garden Club, had to be dug up because of a crumbling drainage pipe. This meant the loss of a couple of spruce trees. 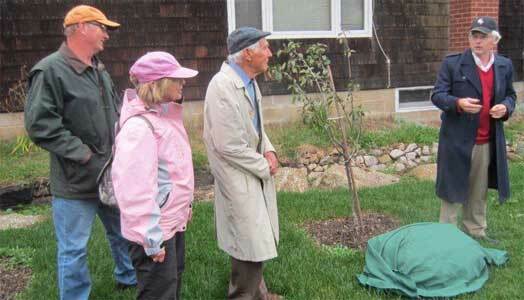 Through the initiative of the Friends of Nature, these were replaced with three fruit trees and a hemlock. 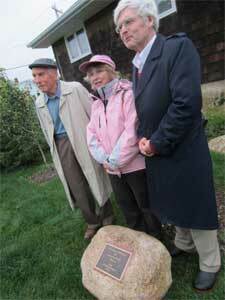 To honour the many and varied contributions that Mickie and Rudy Haase have made to the Chester community and all over the world, a plaque was placed on a rock in front of those trees. The dedication took place September 19, 2011 – Mickie’s 85th birthday. She was not able to attend, but their son, Bruce, and his wife, Viktoria were there in her place. A congratulatory letter from Elizabeth May, Leader of Green Party, was read by FON President Syd Dumaresq. Rudy Haase, Heather MacKinnon and Syd Dumaresq. 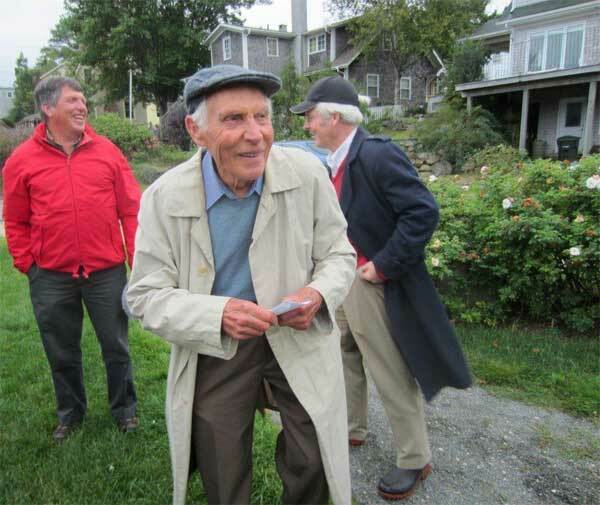 From left: Brad Armstrong (District 3 – Village of Chester Municipal Councillor); Heather MacKinnon (President Chester Garden Club); Rudy Haase and Syd Dumaresq.